Sira Road, NH-4, Maralenahally Tumakuru - 572 106. Karnataka. The institute has an excellent infrastructure. All the departments are well equipped with good laboratories. The institute has a very good academic ambience. The Students are punctual and regular in attending classes. 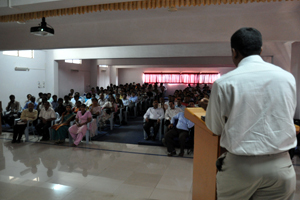 Modern facilities are used for effective teaching such as LCD projectors, Over head Projectors and interactive CD’s. A central computing facility and internet with high speed connectivity of 20 MBPS leased line which is kept open for the students daily from 8:00 AM to 8:00 PM. Shridevi Institute of Engineering & Technology strives to excel in imparting quality education inculcated with ethical, moral and spiritual values to engineering and management students to make them globally competitive. Sira Road, Tumakuru - 572 106. Karnataka. Copyrights © 2010 - 19 All Rights Reserved by Shridevi Institute of Engineering & Technology. This Portal is Developed and Maintained by: System Admin, SIET.